Citing the fact that 70 percent of Cuyahoga County transit users are black, and the fact that blacks are five times more likely than whites to take public transit to work, the local advocacy group Clevelanders for Public Transit has filed a Title VI complaint with the Federal Transit Administration (FTA). The complaint alleges that the closure of Superior Avenue through Public Square has placed a disproportionate burden on people of color. Riders have been displaced, resulting in missed connections, longer wait times, and longer walks to available stops. "Additionally, whether intentional or not," reads the CPT press release, "the displacement of bus riders to stops outside of Public Square has effectively segregated the heart of downtown Cleveland by displacing transit users from Public Square. 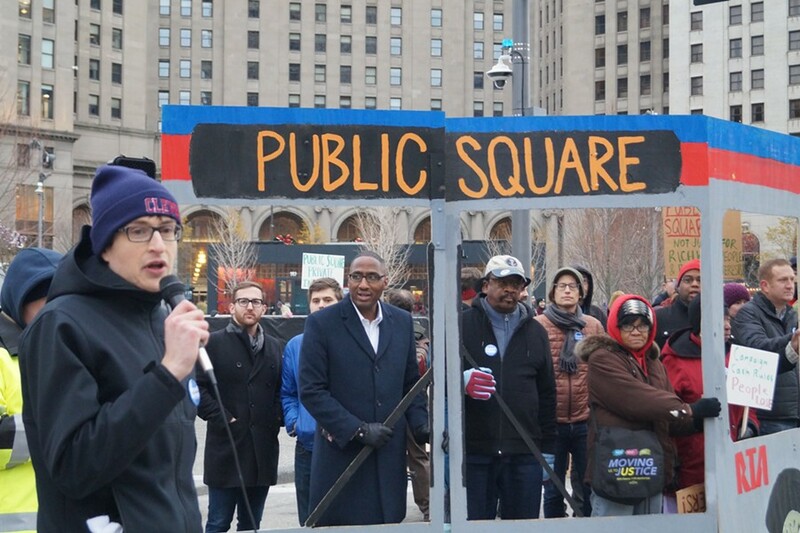 While Public Square used to be more representative of Cleveland, today’s Public Square is largely vacant outside of special events — many of which have no use to transit users who lack the luxury of extra time to indulge in food trucks, farmer’s markets, or carriage rides as they traverse Public Square." Title VI refers to Title VI of the 1964 Civil Rights Act. It stipulates that federal funds may not be used in any way which results in discrimination. "If a recipient of federal assistance is found to have discriminated, and voluntary compliance cannot be achieved," reads the DOJ description, "the federal agency providing the assistance should either initiate fund termination proceedings or refer the matter to the Department of Justice for appropriate legal action." That point may be moot, as the FTA will collect a $12 million debt next Tuesday (2/21) if Superior Avenue through Public Square isn't open by then. That debt is a piece of a much larger ($142.8 million) funding agreement in 2004 that helped fund the creation of the Euclid Avenue Corridor. The federal funding was premised on the creation of a downtown transit zone with exclusive bus lanes running through Public Square. RTA was in breach of its contract when Frank Jackson closed Superior. Mayor Frank Jackson, who now clings to the "threat of terrorism" as his final, irrational justification for continuing to keep Superior closed, has disregarded every opinion contrary to his own. When RTA released a preliminary summary of a consultant's safety study last week, Jackson went ballistic, accusing the RTA of failing to negotiate in good faith and dispatching his COO Darnell Brown and Police Chief Calvin Williams to question the study's findings, key among which was an opinion on terrorism: To the extent that it's a threat at all, terrorism would be equally likely if Superior Avenue were open or closed, wrote James Tucci, the President of K&J Safety and Security Consulting Services. The Plain Dealer's Ginger Christ later reported that Jackson felt the study was insufficient because it addressed only the current threat of terrorism, not the potential threat of terrorism, a meaningless distinction. If Superior remains closed and the $12 million debt is collected, a legal battle will be no doubt forthcoming about who has to pay it. In the meantime, the FTA is investigating the Title VI complaint, it has said. This isn't the first action CPT has taken to try to re-open the Square. In addition to weekly attendance at Monday evening city council meetings this month, including a demonstration last night outside City Hall, CPT has asked city council members to assert their legislative authority. Via an ordinance contained in a 2008 inter-agency agreement between the city and RTA (Ordinance 893-03), only city council and the RTA Board of Trustees are empowered to modify or amend the provisions of the agreement, including closing Superior. Councilman Brian Cummins, for one, has acknowledged the legitimacy of 893-03, but Council has yet to act.